Maryland has a thriving wine scene, as the state’s soil is conducive to grape-growing. And wine bars are the places that best exemplify this rich agricultural heritage. At the wine bars across the state, you’ll not only find some of the tastiest local, national and international wines, but also an atmosphere that will help you unwind. Here are our 10 favorite wine bars in the state. This chic wine bar is the “it” spot in Annapolis. Kevin Spacey even showed up for a party here. 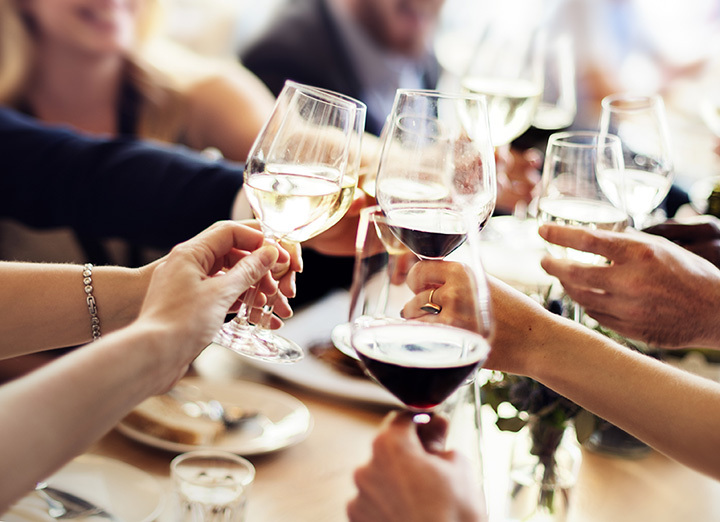 At Red Red Wine Bar, you can find local celebrities, Annapolis natives, college students and everyone who wants to enjoy a glass of wine in a chic urban setting. The decor is rich, bohemian, and fabulous. So is the wine selection. You know how you expect to see amazing wine lists at top restaurants in New York or San Francisco? Few would ever think to visit the small town of Havre De Grace for such a stunning wine selection, but you should. Wine Spectator Magazine listed them as having “One of the Most Outstanding Restaurant Wine Lists in the World.” It’s incredible. If you want to try something unique or are looking for a vintage wine, this is where you need to go. They have over 350 wines to choose from, 80 of which can be tried by the glass. This makes it incredibly easy to find a new wine to fall in love with. All of your friends are likely to find a new favorite or two in this chic wine bar near D.C.
A departure from the swanky vibes of the other wine bars on our list, this wine bar has a self-serve area with dispensers. If you want to expose someone to wine without the pretense, this is a fun place to go. The atmosphere is hip, the vibe is friendly and the wine is excellent. Sink into a comfortable booth, relax in this calm setting to discover your next favorite wine or vintage. This is a local hot spot that has also received national attention and was featured in USA Today. Still, don’t let the buzz fool you. It’s an awesome spot to go because even with the increased attention, they have stayed true to their initial vision. The wine is fabulous, the atmosphere welcoming and relaxing. The food is equally superb and made using fresh, local ingredients whenever possible. This wine bar is far more than a bar. You can actually make your own wine and try a variety of other locally-made wines. How fun! They say you can “taste and learn,” making this a fun party spot, and an awesome place to go with a group of friends. Enjoy sipping your next favorite wine while sitting outdoors at this waterfront café. The sun shining on your face and view of the water will make having a glass of wine even more fabulous. Much of the wine they serve is made using grapes that were farmed in sustainable ways and are organic—ideal for wine lovers looking for organic options. They also received the “Best Wine Bar” of Baltimore award in both 2009 and 2012. Wine bar plus incredible Northern Italian cooking makes for an incredible combination in Baltimore. They even bring wine makers in from Italy for special occasions and dinners. Located at the Inner Harbor, Cinghiale Osteria is where you can pair incredible Italian wines that are hard to find with authentic cuisine. For a true taste of Maryland, head to Maryland Wine Bar. They boast the largest wine selection of Maryland-grown wine so you can literally taste your way around the state without ever leaving your chair! Berlin is a really cool town close to the beach so this should definitely be a stop on your way to, or from, Ocean City. A comfortable neighborhood wine bar, Grapes is an excellent spot to meet up with friends after work or on the weekend. In the warmer months, they have patio seating that fills up fairly quickly, especially with dog lovers looking for a friendly spot to relax and enjoy a glass of wine. They have fun events on a regular basis including Chef’s Tasting Dinners.